Do Atomic Fireballs Come in a Sugar Free Version? 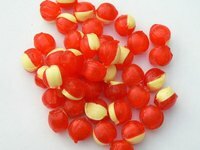 Atomic Fireballs are a candy that once you've tried them, you don't forget them. These hot and spicy hard candies have been a favorite of children and adults for many decades. The family owned company, Ferrara Pan Candy Company created the Atomic Fireball in 1954 to rave reviews. Even though the company was only able to produce approximately 200 cases of the candy a day, they started getting orders from candy distributors totaling up to 50,000 cases a day. Needless to say, the Ferrara family knew they were onto something hot. The Atomic Fireball was created using the hot-panned process which builds upon individual grains of sugar until they grow to the desired candy size. The flavor, color and other ingredients are added as the candy continues to be moved around in the hot-panning process. Presently, Ferrara Pan Candy Company does not offer a sugar-free version of the Atomic Fireball. Although there may be some sugar-free candies with similar flavors, nothing quite matches the heat and spice of an Atomic Fireball.